“It doesn’t look any different,” says Mum, looking out over Scarborough’s arcing South Bay from our hill top car park. This is quite a statement considering it’s been well over 30 years since we were last here. “What, not even a little bit?” I press. She takes another scan, slowly processing the colourful, arcade-packed promenade, brooding hill top castle and busy, sandy beach. “No – even the donkeys look the same!” I notice Dad nodding his head in agreement. Seeing as I was less than 10 the last time we visited, I decide to pull up some vintage images on my phone and see if Mum’s 70-year-old memory is holding back on us. A few swipes later and we’re scrolling through faded photos of ‘The Queen of the Yorkshire Coast’ in all her 1970s/’80s pomp. Turns out Mum’s right – it really is exactly the same. I’m actually quite pleased, as our reason for visiting this weekend is to take a gentle stroll down memory lane and soak up the nostalgia of holidays long past. 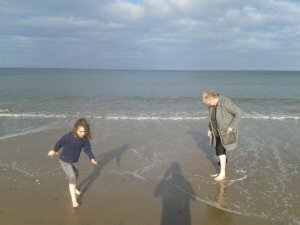 Of course, the last time I came here, sometime in the early ‘80s, it was just the three of us: Mum, Dad and I. Mum would always be wanting to spend time on the beach and go for a paddle, while Dad – fidgety about the idea of sitting on the beach all day – would find excuses to go back to the car so that he could play around with his new-fangled CB radio. And me: all I wanted to do was spend the whole time playing on the mesmerising pre-PC video game ‘machines’ in the amusement arcades. How I loved those machines. This time around we have my five-year-old daughter Ellie with us. She looks excited as she takes it all in, hopping eagerly from one foot to the other. I don’t notice it at first but I soon realise I am smiling. I wonder if this is how my Mum and Dad felt when they brought me here for the first time. Just as I feel like I’m about to come over all sentimental and existentialist, Ellie blurts out that she needs the toilet. I should’ve seen the foot-hopping for what it was. Ten minutes later and we’re strolling along the prom on what is a beautiful autumnal Sunday lunchtime. The sun is out, the resort is bustling and, thanks to a local fun run event, there’s an infectiously convivial spirit all along the front. Ellie is foot-hopping again but this time it’s for genuine reasons of enthusiasm – we’re nearing the cavernous Olympia Leisure amusement arcade. She has recently become semi-obsessed with those age-old ‘coin pusher’ 2p machines that have been around for yonks so the idea of going inside a three-floor arcade filled with them is making her hop with an exuberance normally reserved for unexpected ‘number twos’. “Can we go in Dad, please? PLEASE!” My Mum and Dad look at me with a knowing look and matching wry smiles. This is history repeating itself and I know it. “Of course we can, sweetheart.” I’m happy to indulge as I actually remember feeding my long-saved 10 pences into the likes of Star Wars and Paperboy, literally for hours on end in this place, oblivious to the flashing lights, shrieking punters and beeping sound effects all around me. I also remember how surly I used to get when my Mum and Dad wouldn’t give me any more 10p’s and made me leave. I was fully expecting history to repeat itself in this respect too when the time came to go 45 minutes later but, thankfully, Ellie turns out to be more laid-back about moving on than I ever was. Probably because she’s won a shed load of prize tickets that can be exchanged for treats before we go. After another, shorter stop in a smaller arcade further along, we adjourn to the beach for a hot snack and a cuppa. At this point, Dad takes the opportunity to tell me how he used to come here with his mum when he was a little boy in the ’50s. 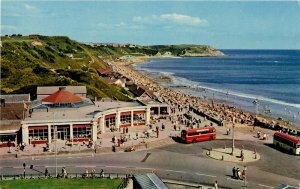 Sitting there, watching small children build sandcastles and ambivalent donkeys ferry little ’uns back and forth, it struck me just how integral seaside resorts like Scarborough have been to the childhoods of generations of British holidaymakers. I felt pleased that this resort, today anyway, seemed like it was doing a good job of keeping this heritage in good shape. 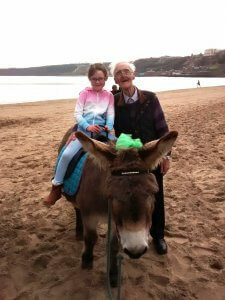 The photos I got of Ellie and Grandad sitting together on the sand and having a donkey ride (not Grandad!) were pretty magical too. Returning to the car park via one of the glorious Victorian funicular cliff tramways, we leave South Bay and head towards the north end of town for a place that, for me, has always typified Scarborough – Peasholm Park. 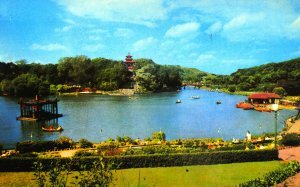 With its beautiful Japanese gardens and towering pagoda surrounded by tree-filled hills, this large and leafy park was always the first place I wanted to come whenever we headed this way on our many jaunts north to visit Dad’s family during the ’70s and ’80s. The star attraction was always the large central lake. Some of my fondest memories are of paddling around it in heavy old canoes, listening to brass bands play on the island bandstand, and watching model battleships engage in dazzling naval warfare re-enactments. I’m absolutely beaming as we walk through the gate and see the lake waiting there to greet us like a long-lost friend. Aside from the addition of a scenic waterfall, it looks and feels much the same as it did back in the day. Ellie is initially disappointed to discover the park doesn’t have any play equipment, but she soon bucks up when Nanna buys her an ice cream and pays for us all to go on a dragon-style pedalo. Naturally, it’s up to me to do all the pedalling but I don’t care – getting the chance to do a (lengthy) lap of that lake one more time with Mum, Dad and Ellie feels like a privilege. The only downside is that, due to modern health and safety regulations, the boat handler refuses to take a photo of us on the pedalo when we come back in. Next up is a very pleasant return trip along the coast to Scalby Mills on the evocative North Bay miniature steam railway. While Dad seems to remember a lot about this run, it only flickers a few fleeting memories from the farthest reaches of my brain. The clouds are darkening on our return so we decide to head back to the car, Ellie adamantly feeding nuts to the chipper squirrels even as the first few drops of rain start to fall. We drive out along the picturesque North Bay, where the iconic Corner Cafe once stood overlooking the resort’s quieter and altogether more scenic beach. “Look; the Corner Cafe’s gone,” says Dad, pointing to a generic looking collection of holiday flats, grocery stores and bars.